Land Rover Freelander 2WD driven | What Car? Although most Land Rover owners never venture farther off-road than a gravel car park, they still want to know they can climb every mountain and ford every stream should the fancy take them. So where does this leave the new front-wheel-drive Freelander? Is it simply a pragmatic solution to the needs of urbane urbanites, or is it motoring sacrilege? Well, as the first Land Rover bereft of four-wheel drive its certainly unique, not that youd know it just by looking at it. With the same chunky new lights and re-sculptured bumpers as the rest of the refreshed 2010 Freelander line-up, and the same rock-avoiding ground clearance, it looks every bit as imposing as its butch all-wheel-drive sibling. Of course, with two fewer driven wheels and the absence of Land Rovers trick terrain response system means it wont tackle deep slime and rocky gullies in the same effortless fashion as the four-wheel-drive versions, but its still remarkably competent off-road. The stability control has been recalibrated to take into account the comparative shortage of traction, so you can floor the throttle and the electronics will do their utmost to maximise grip and keep things moving in the right direction. Theres nothing subtle about this style of off-road driving, but it certainly gets the job done, even if in some situations youll feel the car is going too quickly for its own good. After all, those body panels and that exhaust system complete with its catalytic converter and particulate filter arent going to be cheap to replace. Thankfully, this version of the Freelander is still capable of towing a hefty 2000kg, so you can still tow Dobbin to the weekend gymkhana. That said, youd be well advised to leave the horsebox in the lay-by and walk your equine friend across the slimy parade ground, rather than risk an embarrassing arcing shower of mud from those wildly spinning front wheels. Of course, the biggest benefit of losing the four-wheel-drive gubbins is a weight saving of 75kg. Although the Freelander is about as aerodynamic as a haystack, lighter is better when it comes to maximising fuel economy. Power comes from Land Rovers perennial 2.2-litre turbodiesel engine, tuned to produce a modest 148bhp, but prodigious torque. Along with a faster-acting turbocharger and modifications to the engines electronic brain, stop-start technology is also standard to further enhance fuel economy. On a run you should be able to extract a credible 47.2mpg - 2mpg better than the 4WD version. A 23% company car tax rating means business users will pay 2% less than for a 4WD model, too. Undoubtedly, the best aspect of the engine is its easy low-rev performance. It pulls like a traction engine from just above idle, making the six-speed manual gearbox (an automatic isnt available) all but redundant, even when tackling a long incline. Work the engine beyond its comfort zone, though, and power tails off rapidly something to think about when overtaking farmer Giless tractor on a busy B-road. 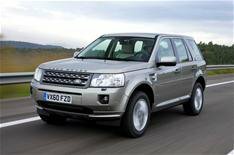 Lack of spirited performance aside, the 2WD car exhibits the same comfort that weve come to know and love from the Freelander, even if it doesnt feel quite as glued to the road as 4WD models. Its also every bit as frustrating in bends: push hard and front-end grip runs out quickly and its body leans like a trawlers in a force 10. The cabin gets the same mild spruce-up as the rest of the range, including a restyled speedo and rev counter, and a new range of trim options. What havent changed are the imperious high-set driving position and the huge expanses of glass that give the Freelander superb all-round visibility and bathes the cabin in natural light. Nor has the rather dated feel of what the driver sees and touches, courtesy of chunky controls, a mammoth steering wheel, a fiddly touch-screen sat-nav system and a state-of-the-ark stereo display. Although there's loads of space up front, rear passengers arent exactly pampered for legroom, and getting your ailing great auntie through the narrow rear door opening and up over the intrusive rear wheelarch will do little to enhance your chances of a fat inheritance cheque. Boot space is also on the tight side, especially compared with those of modern crossover rivals such as the Volvo XC60. Itll easily cope with the weekly supermarket shopping, but packing for a family holiday will require military precision, even if your trip involves nothing more adventurous than a trip to the Mount Pleasant Guest House rather than Mount Kilimanjaro.